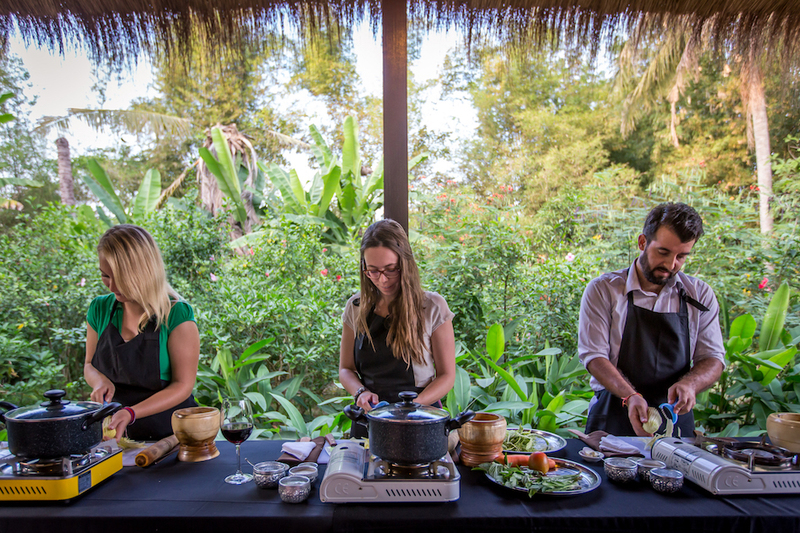 Always dreamed of being a Cambodian chef? This is your chance! 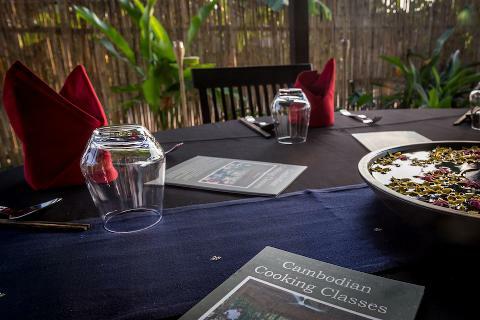 Your Siem Reap cooking class will begin at a temple ruin in the middle of the community. We’ll take a mini tour through a local village, where you’ll get to see locals returning from the rice fields, and maybe buffalo and ox carts being led by their owners. Your local guide will tell you a bit about daily life and introduce you to some of the many fruits and vegetables that are grown locally. You’ll also see local houses and get to peek inside a kitchen (where you can imagine what it’s like to cook an entire family meal on a charcoal pot). 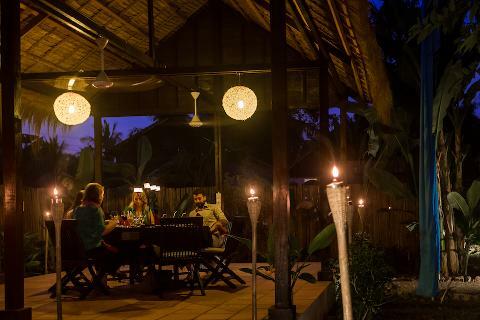 You’ll arrive at our lovely cooking venue (complete with charming herb garden) close to sunset. Your guide will show you some local herbs and you’ll get to collect a few to use in this evening’s dishes. Then scrub up and get ready to cook! 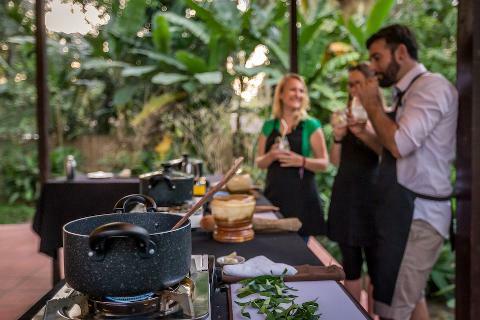 Your Siem Reap cooking experience is very hands-on; your guide will teach you a few tricks and techniques for preparing the ingredients, but everything is done by you. You’ll prepare a starter, a main, and a dessert, as well as a cocktail or herbal tea, depending on your choice. You’ll also learn some simple presentation techniques — perfecting for impressing friends back home with your awesome talents at your next dinner party. Before dinner is served, you’ll have time to relax in a peaceful dining pavilion, surrounded by a tropical garden. This might also be a good time to taste-test a cocktail or herbal tea before settling in to enjoy your fresh, tasty Khmer creations. Our professional team will serve your dishes and you can finally savour the flavours of your labour! Best of all, if you love what you made, we’ll help you replicate it at home — you’ll get a recipe card to take back with you. Dress standard: Please dress respectfully for visiting a local community. Trousers, skirts, or knee-length shorts and a shirt that covers your shoulders are appropriate. Comfortable shoes or sandals suitable for walking are also recommended. Mosquito repellent can be useful, but the guide will also carry some for your use. During the rainy season, you should bring an umbrella or light rain jacket. Plastic ponchos are also readily available for a small sum in local shops and markets. Additional Information: We can accommodate vegetarians and other dietary requirements. Please inform us if you have any allergies or you do not eat certain foods when you confirm your tour with Siem Reap Urban Adventures, and when you meet your local guide. It is usually very hot in Siem Reap. There will be opportunities to purchase water, but you may also want to bring a supply with you. Child Policy: Children under age 12 are not permitted to join this tour. For families with younger children please contact our team to arrange a special private class. 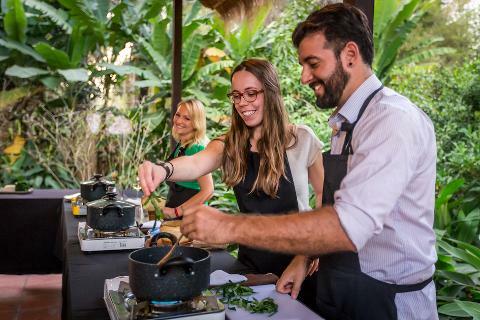 Indulge in a made-by-you 3-course meal, along with a Cambodian cocktail, served up in a pretty tropical garden. 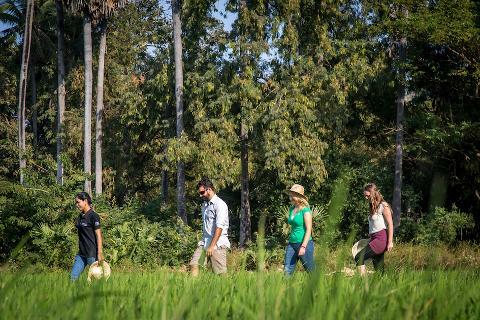 Walk through a local village and learn about Cambodian cuisine in the Siem Reap countryside. Start your adventure at the ruins of an ancient temple. Huomio: Tuote on tarjolla pyynnöstä. Vahvistamme tuotteen saatavuuden mahdollisimman pian tilauksesi jälkeen.